Without realizing it at the time, I almost tripped over Michael Jackson. On a trip to Universal Studios Orlando in 2003, I was stumbling back to my room at the Royal Pacific after a late night at CityWalk. It was about 1:00 a.m. as I turned a corner and walked up a sidewalk leading into the back of the hotel. Sitting on the ground, legs outstretched, was a very familiar looking guy with dark hair and a pale complexion, wearing a white shirt and dark pants. He was slumped against a wall next to the doorway of a video arcade. In what little light there was, he appeared to be reading a paperback book. There wasn't anyone else around who I could see. I had to maneuver carefully to avoid stepping on him. As I passed, we glanced at each other and smiled. We may have said hello. In my slightly inebriated state, I thought, "A Michael Jackson impersonator at Universal. Cool." And up to my room I went. The next day, my friends were abuzz about news that the actual King of Pop had brought a group of kids to Universal Studios and had taken over an entire floor of our hotel. "Why didn't someone tell me?" I whined. "I saw him last night. I could've at least said something intelligent to him." Or not, considering the number of beers I'd had. As today's sudden passing of Jackson rages over the news networks, blogosphere and Twittersphere, I keep replaying that very brief encounter in my head. Then, he would've been a year beyond the baby dangling incident in Berlin, but two years away from the media circus child molestation trial that would move him from "strangely eccentric" status to "full freak" in the court of public opinion. At that single moment in Florida, though, he was just a guy--no bodyguards, no entourage, no glove, no mask, no dark shades--enjoying some late night quiet time to himself while some of the kids traveling with him played in the arcade. I don't expect he got a lot of quiet time in his life. Maybe it was better I didn't realize it was actually him. Love him or hate him, you probably have a strong opinion about Michael Jackson. Maybe more than one. He was a ridiculously gifted entertainer known equally for his off-the-chart bizarre behavior. Still, if you grew up in the '70s or '80s, at least one of his songs is in your life's soundtrack ("Off the Wall" is in mine). If you're a Disney fan from a slightly later time, say around 1986, you know Jackson as Captain EO, leader of a misfit gaggle of alien creatures on a mission to bring music to a mysterious planet ruled by Angelica Huston (in her best Wicked-Witch-Meets-Queen-Alien mode). That eponymous 3-D film was a major coup for Disney, considering the talent involved. 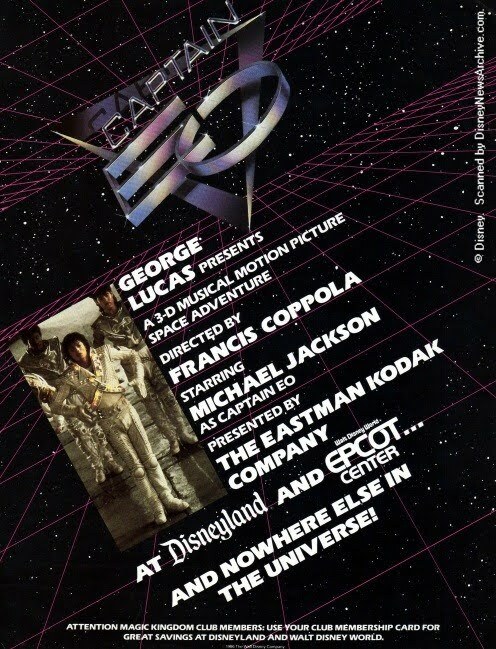 Produced by George Lucas and directed by Francis Ford Coppola, "Captain EO" showcased the era's biggest musical superstar at the absolute height of his popularity--was there ever a better fit for Disneyland than the perpetual man-child Jackson? Despite looking a bit goofy when he wasn't performing his signature dance moves onscreen--a rough and tumble leading man he wasn't--Jackson was clearly having the time of his life, making the 17-minute flick an entertaining hoot with theater-filling special effects. It would play for a dozen years at at least one Disney park or another. You can still enjoy it on YouTube, even if that format doesn't really do the film justice. 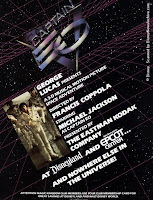 "Captain EO" was the subject of the cover story for the Fall 1986 issue of "Disney News." In the article, producer Rusty Lemorande didn't hesitate to single out Jackson: "He was a composer, a co-choreographer, a dancer, a singer, an actor, a collaborator on every level, and it each case, he collaborated with an amount of passion unequaled by anyone else in the show." Time and circumstance have clouded Jackson's legacy. We sometimes lose sight that at his peak, there was nothing the man couldn't do. For me, I'll always remember him as the guy I recognized right away, but didn't. Rest in peace Michael. I hope you enjoy your book.